Lately I’ve not been feeling good (plus, as you know, I wanted to celebrate my birthday) so I decided to treat myself (and the hubby) with a relaxing weekend in Borghetto sul Mincio. 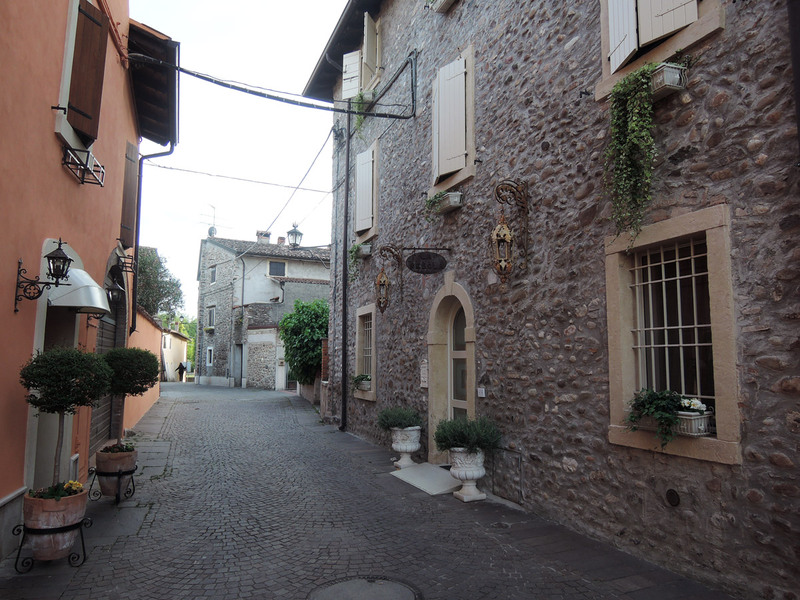 We visited a beautiful park (another post asap), some tiny charming villages and we stayed at a super romantic B&B called Maison Resola. Due to the astounding location, the recent restoration, the shabby chic décor and the spacious rooms, Maison Resola isn’t cheap. I must confess I found a super interesting offer online so I immediately seized the opportunity. The house is marvellous. If you are recurring readers of my blog, you already know how much I love stone houses, possibly with flowers on the windowsills or covered in ivy or with hydrangea bushes on the courtyard. So my heart skipped a beat when I first arrived. Wonderful first impression. Then I met Tiziana, the owner, very kind and welcoming. She led us to our room, called Camille. Every room has a different female name, which refers to the delicate and evocative female portrait over the bed (by artist Antonio Amodio). The room had dark wood parquet, white walls with a part of exposed stones, white and beige furniture. Very clean and elegant, perfect room temperature. As soon as Tiziana and Matteo left (he had to move the car into the private parking lot), I immediately inspected the room out of curiosity. First things first I opened the window to enjoy view on the rooftops and the castle. It made my day. Then I spotted the fresh fruit dish (always a plus, moreover there was a plum) and the kettle (another plus). The only flaw I found was the lack of wall sockets (we charged my mobile in the main room, next to the mirror cabinet, and my husband’s in the bathroom). Nowadays we all have at least one smartphone. If you also have a camera, a tablet or a laptop this can be a problem. Simply resolvable by placing a power strip in each room. I didn’t tell Tiziana cause before leaving I had already given to her 2 other suggestions regarding the tea corner of the room and so I didn’t want to go too far. The bathroom’s highlight was the big rain head shower. An another thing I loved was the (along with soap, shower gel and shampoo) the body cream dispenser. I’m so lazy I never use it but with the dispenser I couldn’t back out! It surprised me cause I found it very appropriate. That very day I was telling Matteo that I feel good only while travelling, visiting new places, exploring… and eating good meals 😉 When home I always feel like “unsettled”. So I really appreciated this message (so that I brought it home and it is here in my drawer). At night the B&B was quiet since there’s no car traffic at all and the village is super tiny. In the morning Tiziana set up two breakfast tables for us, one in the hall and one in the terrace. Despite the tempting view I preferred to eat in the house, cause that morning it was a bit cold. Breakfast was huge: 5 homemade cakes, cereals, jams, nuts, dried fruits, yoghurt, juice, bread, cold cuts, cheese. Eggs if you want. And above all fresh fruit. Finally! It is hard to find it at breakfast! I almost never find it when I travel. So I eat double portion: strawberries, mango, melon, pineapple. The pears cake was delicious. And so the pear and vanilla jam. I would have preferred to eat fresh baked bread (an maybe a croissant) rather than sliced bread, but it was Sunday and I guess the bakery was closed. I loved this experience and I can easily suggest Maison Resola to spend some time in a romantic place, close to Lake Garda, Verona and Mantua.